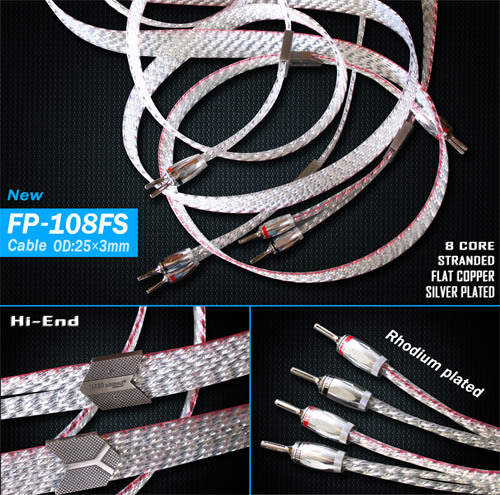 FP-108FS on the appearance of the first one wins because of its flat-plated silver square core copper core with airtight transparent hose wrapped, and then twisted into a regular 8-character shape, the eight-core parallel arrangement, into a cable Difficulty of the process is very high, not the general factory can be manufactured. This line is not only silver shiny, the twist of the lines more streamer flashing beauty, line body at both ends of the mouth with flat iron gray metal sets, clever styling with pointing, and looks stable Extravagance, and in the head assembly YARBO (Jardine) top rhodium-plated whole forming banana plug to ensure that the effect is truly match! 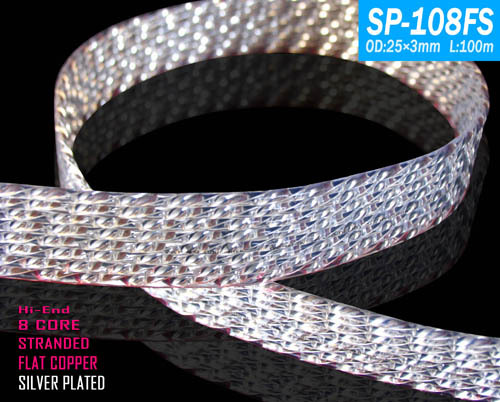 This line has a very excellent sound balance, the sound line is most likely to have too strong personality or sound rendering, because this type of wire will make the whole set of sound combination of sound deviation. 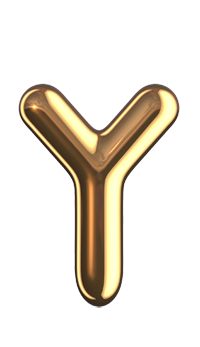 There are a lot of enthusiasts that the silver-plated line of the bottom of the sound and treble standard, but a few years as a cable engineer to tell you that only poor design and lack of materials, silver plating will have this situation; thickness is very moderate, Music melody smooth to the incredible natural increase, high frequency brace, the sound is very open, so the instrument is particularly rich in the overtone, sound naturally have a better degree of truth, and recording venues of the Church is also very Obviously, especially some live performances of the recording, immersive feel more intense; and FP-108FS low-frequency stretch is excellent applause, excellent analysis, from high to low range smooth smooth, pure sound , Not only to the music within the recording of the information clearly clear fax, not the slightest blur, even the usual and inconspicuous details also revealed very clear and natural, like the singer's lips and teeth, put the luck, guitarist String trembling, the pitcher's slippery pull bow and so naturally the action, hear is also very clear, of course, will enhance the recording of the truth and audibility, and this line by the headset Listen to the details of the instrument will be more clear, light percussion more obvious, more crystal clear, joint positioning and before and after the level is also clearly presented, YARBO / FP-108FS is a rare market can really reproduce the wonderful movement Hi-End Value Line.